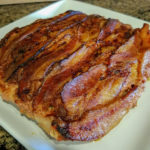 Leave a Comment on Cook brisket the easy way! I don’t cook brisket every week but I do love a well cooked one like the next guy. There seems to always be the argument on whether or not to wrap it and what to wrap it with if you decide to go that route. I was talking to Derek Perry of @freedomsohard (great instagrammer by the way. Go follow him right now!) We were talking about various methods and he mentioned his favorite to me so I decided to try it. I believe Chad Ward from Traeger Grills also swears by this method. I hope you enjoy it. 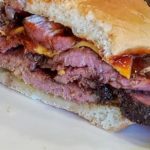 I won’t cook brisket any other way anymore after trying it myself. Haha. So that’s it! Let me explain. After you choose your brisket, take it home and trim the fat off. Try to leave about 1/4 inch on the fat side. Try to keep it as uniform as possible. Save the fat that you trimmed off and place it in a foil pan large enough to fit the entire brisket. If you are wanting to inject your brisket (which I will do from here on out) go ahead and do that now. I used a mixture of beef bouillon and my rub and injected it into the brisket every few inches. After injection go ahead and give it a good rub down with your rub. I’ve included a recipe I recently used below. After the rub, place the brisket (fat side down) on top of the fat and get that grill rolling to 225 degrees! 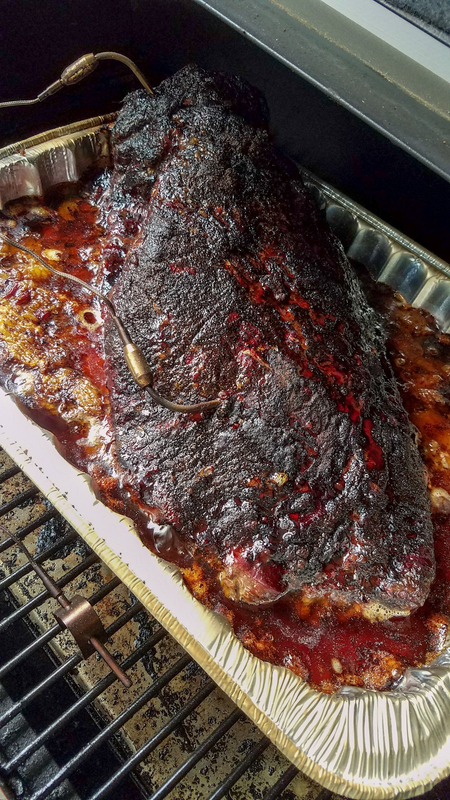 Try to situate the trimmed fat mostly under the flat of the brisket to elevate it off the bottom and bringing it closer to level of the point. Throw that bad boy into your grill at about 225 uncovered. Let it cook until it gets to 160 degrees internal and then cover the entire foil pan with tin foil (or not…your choice I left it off of my cook but for no real good reason. ) Bump the grill up to 275 at this point. Cook it until placing the probe into it feels like butter at room temperature. Depending on various factors, it could be 197 and it could be 205 or maybe even more. For me it was 202 on my latest brisket. Mix all of the ingredients together for a perfect brisket rub!